Actor Nik Dodani tackled coming out, cultural appropriation, and STI testing on the late-night show. It's not easy being Indian and gay, as Murphy Brown actor and comedian Nik Dodani attested on The Late Show with Stephen Colbert. 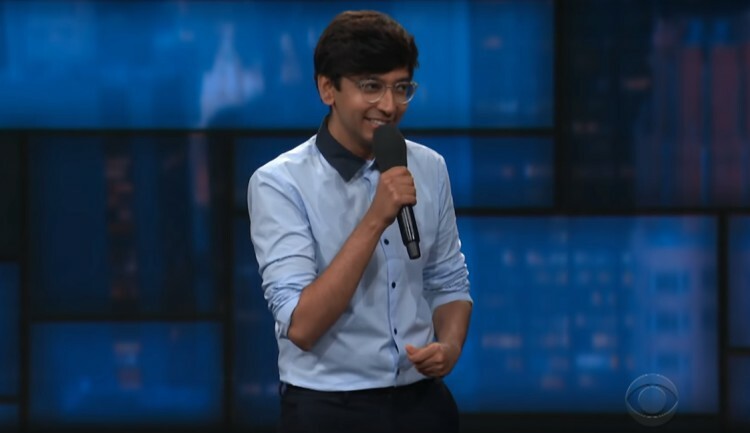 "It's tough being Indian and gay, because Indian culture is still pretty homophobic, which is weird to me, because Indian culture is also pretty gay," Dodani joked to the audience Friday on the late-night CBS talk show. "Just last year, Bollywood released 1,100 movies. Almost every single one of them? A musical." "Not only is Indian culture really gay, but gay culture is really Indian," he observed. "You have bright colors and rainbows, everywhere. People worshipping goddesses everywhere. Condom use, nowhere." "It's a problem!" said Dodani to the laughter of the audience. He discussed how, before his last relationship, he received a round of STI testing. The results took two weeks. Dodani used his comedic talents to satire the anxiety of this waiting period — as well as the phone call from the nurse, who, as he mimed in the segment, slowly revealed the results for each STI. After an especially long pause before the HIV result, Dodani initially moved on. But when a few audience members protested, he assured them, "It was negative!" Dodani also revealed the unique struggles that can come with coming out to Indian parents — a situation he hoped would exempt him from the tradition of arranged marriages. He found out he was wrong. His mother, he joked, "posted an ad on Craigslist that read, 'My son, 24 years old, Indian, gay, works in entertainment, seeks Indian lesbian facing similiar family pressure.'" His father, Dodani revealed, had a better response to his coming out as gay — but one that was also layered with cultural expectations. "That's fantastic, Nik. But isn't it pronounced 'lawyer?'" In addition, Dodani poked fun at the gay community's tendency to divide itself into tribes named after animals, like bears, otters, and cubs. "What if we started doing that to straight guys?" he proposed. "You'd have the weasel. That's the guy who pretends to respect women in order to get laid. And then you have the ... well, I guess that's it." Dodani portrays Pat Patel, a social media guru on the revival of Murphy Brown, which premiered Thursday on CBS with a surprise cameo from Hillary Clinton. The gay actor is also known for his role as Zahid on Netflix's Atypical, which introduced a queer storyline this season. Watch his stand-up routine below.